Autographed copy of Marc’s 192-page book focused on the tools and techniques needed to incorporate hand tools into a power tool shop. Please note that ordering from our website directly is a great way to support us. You’ll pay full price but you’ll get an autographed copy and our eternal thanks. If you want the best price and no autograph, you’ll want to buy the book on Amazon. A digital version can be purchased on Amazon. In the last few years, there’s been a push to return to the roots of woodworking when every step was done with hand tools–from resawing lumber and planing it flat, to cutting joins and creating profiles. Working this way can produce beautiful results, but is it the best method for woodworking in the 21st century? 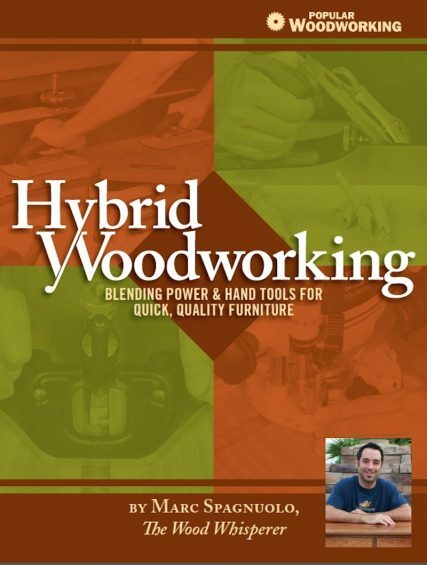 In Hybrid Woodworking, author and Internet woodworking personality Marc Spagnuolo offers a more efficient approach that combines the strength of power-tool and hand-tool techniques. The end result: You save time and effort while producing furniture that still has that stunning handmade look.